One more museum was on Kathryn’s list for art: Sweden’s Moderna Museet (Modern Museum). Neither Max nor I would call ourselves connoisseurs or huge fans of modern art; but, I do like some of the work and I do appreciate some of the talent and I do enjoy being exposed to it; plus, there’s always my artist friend’s (Ellen’s) little voice in my head reminding me that no, just because it’s white paint on white canvas doesn’t mean I could do the same. So, on a beautiful sunny day the three of us ended up on another island, Skeppsholmen, where this building perched atop a hill. This entry was posted in 2017 03 SWEDEN - Stockholm, 2017 Winter Tours, COUNTRY, Europe, Sweden, WINTER TOURS and tagged Abramovic, Hallwyl, Modern, Museum on April 23, 2017 by margaretlynnie. 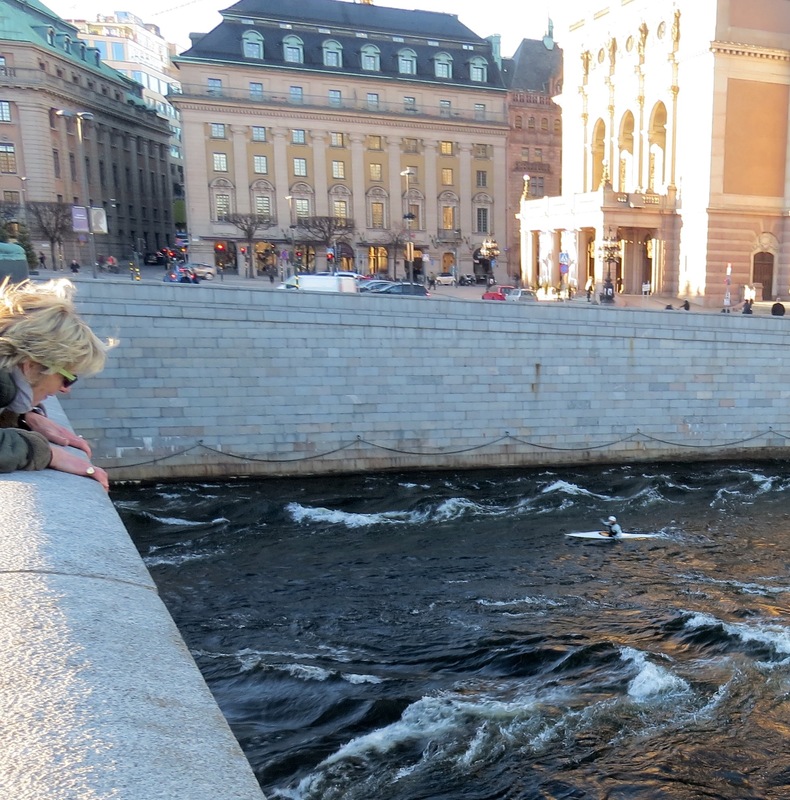 This entry was posted in 2017 03 SWEDEN - Stockholm, 2017 Winter Tours, COUNTRY, Europe, Sweden, WINTER TOURS and tagged Gamla Stan, Medieval, Nobel, Sigtuna, Viking on April 19, 2017 by margaretlynnie. It’s not your eyes… some photos are blurry due to not the best light or good camera action on my part. When Max and I searched for the entrance to the Vasa Museum two days ago we had to go around a rather large and imposing building. Come to find out the building housed the Nordiska Museet (Nordic Museum), Sweden’s largest museum of cultural history, our morning’s destination. I felt I had stepped into a smaller version of London’s Victoria & Albert Museum with its overwhelming displays of art and design. Here, though, the space felt manageable in spite of holding over one and half million artifacts (trust me, I didn’t count them, it’s what their own publicity states). The Nordiska Museet was the brainchild of Arthur Hazeluis and his desire to preserve the Swedish culture; and, the inscription on one of the obelisks at the entrance states this perfectly, “There may come a day when a glance in the past is impossible to obtain.” In 1891 Hazelius also founded the world’s first open-air museum, the Skansen, described as Sweden in miniature. Both of these cultural attractions reside on Djurgarden Island along with the Vasa Museum and an amusement park (not open). This zealous collector began acquiring historical items in 1872 showcasing them in the Scandinavian-Ethnographic Museum. When the collection outgrew its existing site, private fund-raising began in 1888 for the current building. Designed by the Swedish architect Isak Gustaf Clason, the Nordiska Museet was completed in 1907. When you enter the main hall you’re greeted by a towering block of King Gustav I Vasa (1496-1560), the first guy who ruled over a united Sweden beginning 1523. Carved from a piece of oak supposedly he planted (of course), the statue regally stares at visitors from its stepped-throne. It’s motto is “Be ye Swedish” setting the tone for one’s tour. 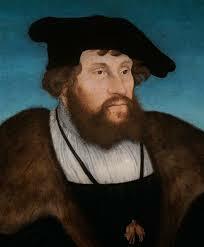 And, if you’re like me and curious to know if this looked like him, here’s a 1542 portrait of the man. until we reached the one piquing our interest the most: that of Sweden’s indigenous people, the Sami, living in Sapmi (this is their term for their people, not Lapp or Laplander). As a semi-nomadic society living in the north, the Sami’s livelihood depended on the reindeer; and, from this animal they obtained food, clothing, tools and shelter. Today only 10% actually practice reindeer husbandry. The reindeer also provided an object for art, such as this one by a noted craftsman, Hatta. The story goes he lost his reindeer and ended up creating these sculptures. He made enough money from selling them he could buy his own herd. In 1978 this museum purchased one of Hatta’s reindeers shown below (roughly 8” x 4” x 3”). Matching exactly the fur from a reindeer’s hide to sculpt his small model, Hatta’s pieces are truly treasures. Like many native people whose land is dominated by a more powerful group, the Sami had others telling their story throughout the centuries. Historians presented them as ‘simple folk,’ and in the 1800s the Sami became the main tourist attraction in Sweden with their colorful clothes and winter wonderland reindeers. Scientists and politicians promoted this perception of the Sami, saying this indigenous group of people should be protected from modern society because they couldn’t handle it. They used phrenology to support this claim of an inferior people. As one vicar and folk school inspector stated in 1906, ‘Laps must remain Laps’. This popular misperception of the Sami began to change when they began their own publication in 1918 titled “The Same People’s Own Magazine”, later changed to “The Sami” in 1961. In 1952 Sami Radio came on the air, and in 1965 the show was broadcasted in Sami. By the 1950s the Sami’s began advocating for autonomy and control over their land. Now there are three parliaments, one in Sweden, Norway and Finland, with all three participating in a joint Sami Parliamentary Council (Russian Sami have been granted an observatory and partcipatory role since they don’t have an officially recognized parliament in Russia). 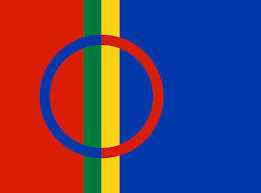 The Sami flag, designed in 1986, represents the sun (red circle), the moon (blue) with the four colors featured derived from the traditional costume, the kolt. Today approximately 80,000-100,000 identify themselves as Sami with roughly 20,000-40,000 in Sweden, 40,000-65,000 in Norway, 8,000 in Finland, and 2,000 in Russia. The range in population can be explained by (1) there’s no census and (2) to define oneself a Sami you either speak Sami and/or have a cross-generational connection. Their struggle for autonomy has sprung from centuries of being marginalized and patronized by the Scandinavian Governments. Today, at least, the Samis are recognized as an indigenous people by the United Nations but progress towards true self-direction hasn’t materialized according to a recent January 2017 report to the United Nations. Jewelry, furniture, dinnerware, you name it–if it sat in a house, clothed a Swede, or told of a tradition we saw it. 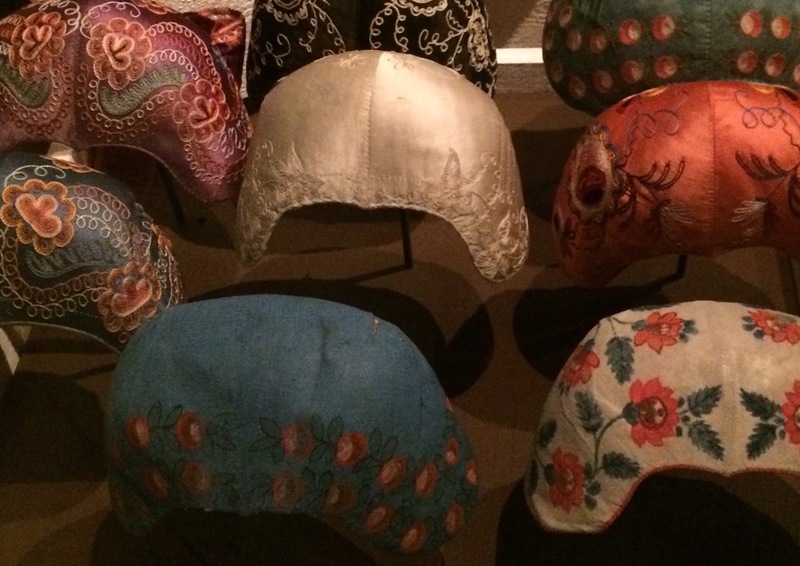 I have to admit I began skipping some of the exhibits by the time we arrived at Table Settings displays; but, I did enjoy seeing the amount of documented textile material and patterns archived in a room of drawers, as did Kathryn. I also noted some women’s 18th-century (machine-knitted) hose, finding it astonishing that they knew this particular one belonged to a Miss Posse, maid-of-honor to King Gustav III (1746-1792). But, hey, if folk can attribute a shroud to Jesus why not a sock to a lady? With dazed eyes we decided lunch was in order, and, once again, we found a museum’s cafe the perfect place to eat and rest. We sampled reindeer stew (delicious, not gamey but rather sweet) and Swedish meatballs (also tasty and filling). You can probably tell from the name of the museum where we traipsed to next. Since it wouldn’t be open Monday and we had plans Sunday to doodle around Gamla Stan, the Old Town located on, what else, an island, we thought we’d better see it today. and within 20 minutes or so we were in front of the museum. Like the Vasa, this museum didn’t shout out its name either but we found it behind another large building. Interestingly I saw a knitted tree like I’d seen in France standing in a traffic rotary medium. In later reading I discovered it’s a form of impermanent graffiti called Yarn Bombing used to decorate barren and cold public places. Definitely did the trick here. After the museum in the morning my energy was flagging at the thought of absorbing another museum’s tales; but, I didn’t want to miss out on any interesting artifact or informative nugget, so in I went. And, another knitted sculpture presented a perfect backdrop to snap a photo of Kathryn. This museum features history covering 10,000 years with the focus on the Vikings followed by the Medieval and Renaissance time periods. A timeline displayed on the floor helped navigating the labyrinth of rooms as they flowed from one era to the next. I didn’t give this museum the tour this history cache deserved; but, I’ll provide some highlights (to me), beginning with the Vikings, the rascals who raided, plundered, and traded. Historians group the years 793-1066 into the ‘Viking Age’ based on the height of the Vikings’ impact on Europe. As opposed to the rustic appearances one would normally associate with such rough characters the wealthy Viking actually could be described as quite foppish in his dress. Tricked out in fur-trimmed cloaks and tunics of bright blue and red with gold embroidery this manly man wore glittering silver brooches hung alongside his gleaming sword. But, there’s a purpose behind this ostentation: by wearing their riches from plunder these guys served as walking recruitment posters to attract others to the gangs of looters. Through ongoing research of graves and settlements we know that Vikings roamed far and wide, from Newfoundland to the Black Sea. The latter area they traded slaves for Islamic silver (Muslims couldn’t own a freeborn Muslim). A silver ring inscribed with “Allah” in Arabic script resides in this collection found in a grave site at Birka, the main trading center in the 700-900s. 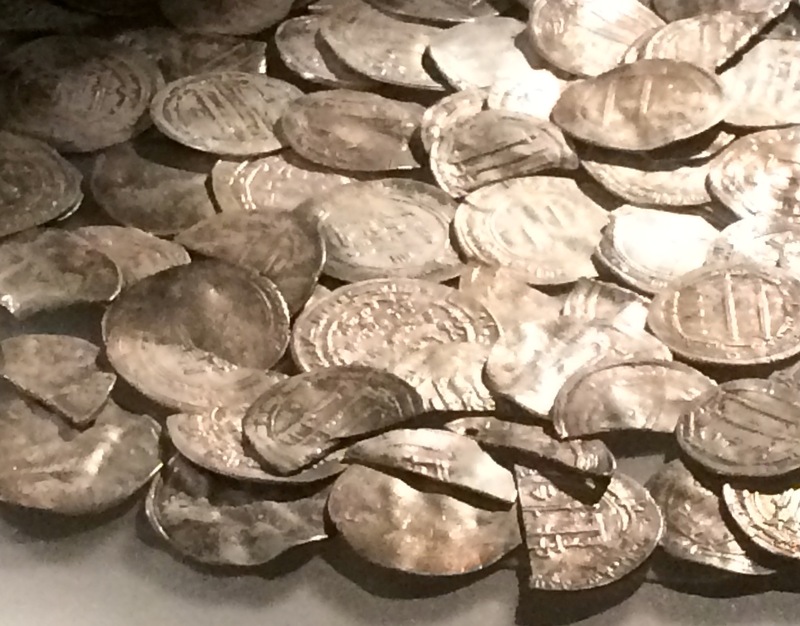 With all the silver floating around to this trade soon the currency of the times became Hacksilver, so called due to items being chopped up and valued on each piece’s weight. During the 9th and 10th centuries this metal almost exclusively came from the Islamic world. So much of our understanding comes from burials, from the tombs in Egypt to graves in England, and the same for the Viking Age. Generally it’s a bit of a guessing game to puzzle out whose bones they are and the significance of items found alongside them. In one grave an older man and younger woman were found. The man appeared to be richly dressed with an oriental belt while the young girl [possibly a thrall (slave)] could have been sacrificed along with all sorts of animals, from horses to birds, joining this guy in the afterlife. Curiously a jar of brown hair was found but hard to explain why. Yet, historians quickly point out that not all of the Scandinavian livelihood revolved around pillaging and plundering. Most of the people during this time were farmers settled in agrarian communities. It was a hard life but important, obviously, as a food source. When those who were also Vikings went off sailing the women controlled the farm, thus gaining a certain amount of power. The key to the household’s storage symbolized this status of power, and women displayed the keys by wearing them around their waists (also practical way to access the home’s food, etc. while keeping it secure). Reading in NATIONAL GEOGRAPHIC a theory behind the forming of this military raiding lifestyle seems akin to that of the demise of the dinosaurs: cataclysmic dust storm [attributed to smashing comets/meterorites and volcanic eruption(s)] caused temperatures to drop beginning 536 C.E. Those inhabiting the far northern part of the world lost their food sources resulting in starvation and death. When the Scandinavian population began recovering over the next few centuries they learned that war was one way to protect themselves and their families in times of scarcity. Add in a sail and, voila! Vikings were born. The museum wove the Sami into the Viking Age explaining that they established a strong trading pattern with the Vikings. 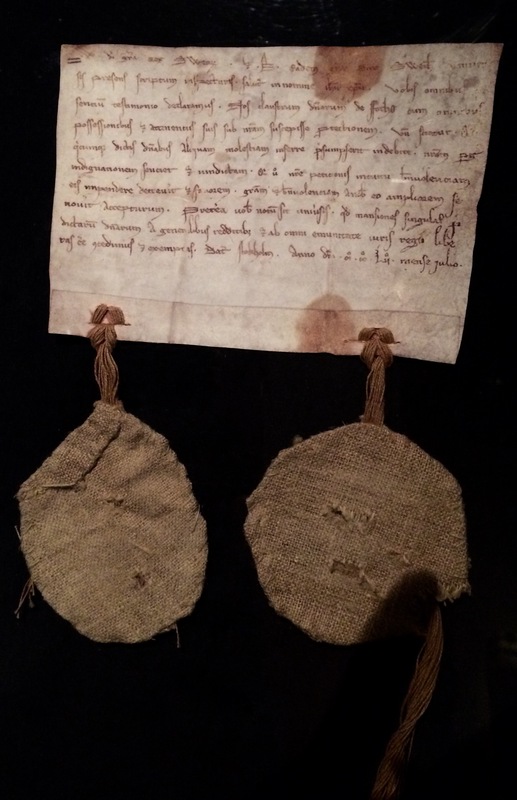 The Samis’ high-quality furs were traded for silver among other goods. Besides trading the Sami and Vikings also shared similar spiritual characters. The Naoidi, the Sami shaman, could summon good or evil forces and travel between the male and female worlds. In Norse mythology there’s the Volva (wand carrier), a female shaman; and, in one grave archeologists found a body dressed both as a man and a woman. These shaman were considered a Seior or sorcerer, able to cast spells and predict the future. The Seior’s symbol was a staff, and on Oland, an island off the coast of Sweden, one of the finest examples of a staff was discovered in a wealthy female’s grave. She was buried inside a ship with a man, probably sacrificed at her death. Bear claws around her body suggest her being wrapped in a bearskin, another indication of her importance. The richness associated with this female coupled with this staff implies she was a Volva as well as a leader of her clan. Another mythological figure for the Scandinavians was the shapeshifter or Sleipner who belonged to Odin, the king of dieties. Like the Naoidi the Sleipner could travel between different parts of the world. 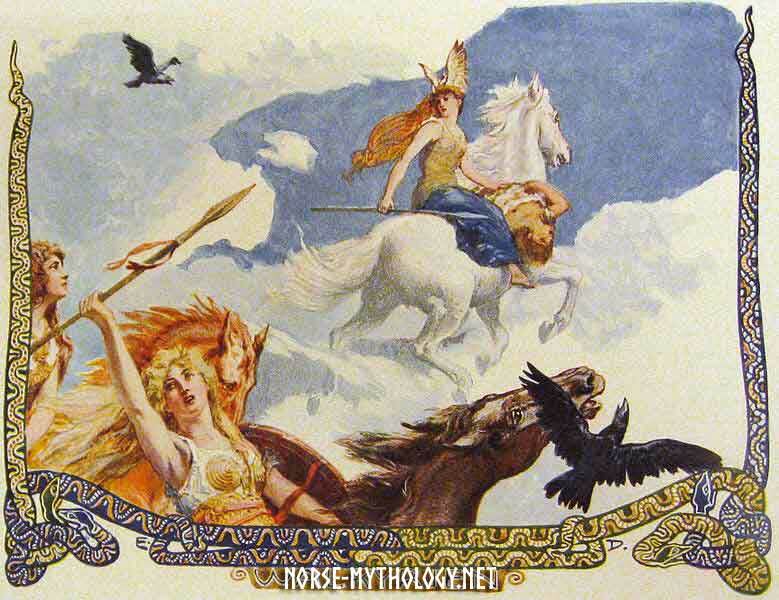 I won’t start down the bizarre path of Odin and his role in Norse mythology only to say he, too, could have effeminate qualities. Women, too, could share male mannerisms such as the female warriors, the Valkyries and the Shieldmaidens. Birgitta Bigersdotter (1303-73) whose political influence undermined King Magnus Ericsson (1316-74) partly by spreading the rumor he was having an affair with one his male associates. Why? Well, maybe it’s because she wanted him to wage war against the infidels, i.e., lead a crusade, vs. fighting the Danes, fellow Christians. She founded her own religious community and later became a saint in 1391 due to her visions and revelations (now one of the six patron saints of Europe thanks to Pope John Paul II). 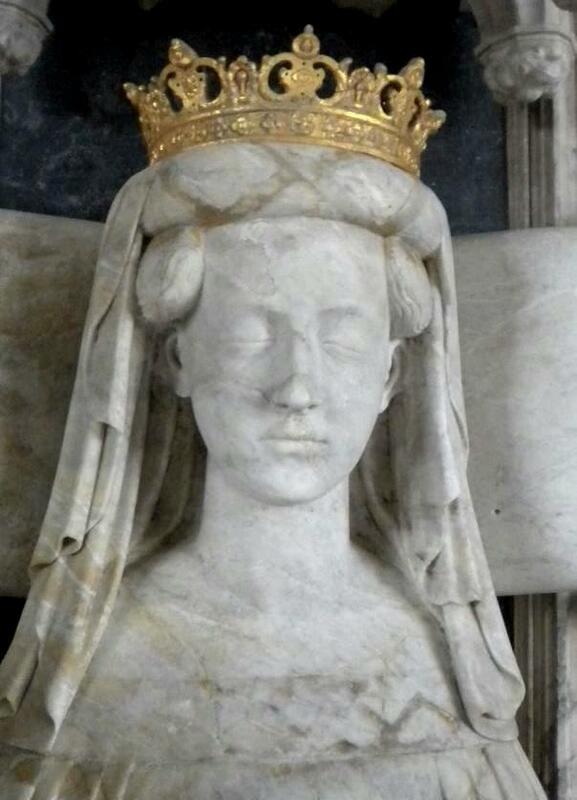 Queen Margareta (1389-1412) who ruled Denmark, Norway and Sweden after creating (forcing) a united kingdom called the Kalmar Union in 1397 (signed at Kalmar, Sweden). The union lasted until Gustav I Vasa wrested Sweden from Denmark in 1523 (he’s the big guy cut out of oak at the beginning of this post). 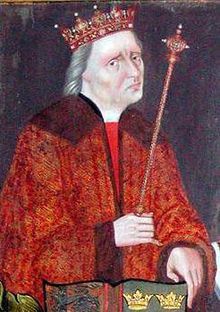 Margareta, whose own son died, adopted her sister’s grandson, Bogislav of Pomerania, renamed him Erik (if my name as Bogislav I’d change my name, too), and proclaimed him king of Norway in 1389 and subsequent heir to her throne. Below is a 1388 horn with Norwegian coat of arms carved on one side and the other two probably intended to carry both Sweden and Denmarks’ when acknowledged as ruler of those countries in 1396. Queen/King Christina (1626-89) was Gustav II Adolf’s (1594-1632) only child and thus, was raised with the education and military training of a male heir. This decision could be due to her possibly being a hermaphodite (at her birth they thought she was a boy). Crowned in 1644 she abdicated in 1654 in favor of her cousin, Charles X Gustav, and left immediately for Rome where she is buried in St. Peter’s Basilica. Interestingly, she developed a strong friendship with Rene Descartes and also championed the arts and sciences during her brief rule. Fredericka Bremer (1801-65) whose novel, HERTHA, championed women’s rights to study at university, to become doctors, teachers, priests, and who advocated for childcare out of the home such as day nurseries and infant schools. During 1849-51 she visited the USA and connected with feminists there. And, how in 1921 after years of riots and rebellions due to hunger and poverty Sweden voted in universal and equal suffrage. With everyone becoming a Swedish citizen with the power to vote the country became a fairer welfare state, one envied today. And, one I had completely missed but ran back to see after Max exclaimed about this extraordinary exhibit: a quintessential MDT (Max Disaster Tour). It was composed of unearthed remains of some of the 1800 poor souls who lost their lives in the Battle of Gotland July 27, 1361 when farmers fighting the Danes were slaughtered because their fellow towns people wouldn’t open the walled city’s doors (there had been growing conflict between the farmers and the town’s residents). So, two excellent museums in one day meant time to call it quits. To home we went and feasted on, what else, our own Swedish meal, which Kathryn arrayed: pickled herring, smoked salmon, vasterbotten cheese, knackerbrod (hard crackers), liver pate, and meatballs with lingonberry preserves. And, yes, we almost ate it all. More to come in PART V! 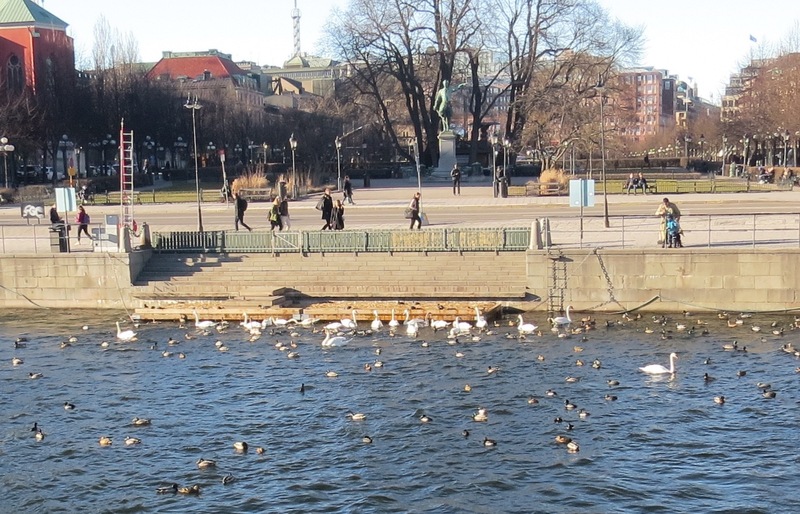 This entry was posted in 2017 03 SWEDEN - Stockholm, 2017 Winter Tours, COUNTRY, Europe, Sweden, WINTER TOURS and tagged History, Museum, Nordiska on April 17, 2017 by margaretlynnie. It’s only appropriate that on the day we visited Fotografiska, Stockholm’s Photography Exhibit Hall, that a lovely photographer would join us. So, we awaited her arrival checking the street every now and then in anticipation. On one of the peeks out the window we caught sight of her, and our friend from home, Kathryn Davis, had arrived! Unsure of her energy level after a long, overnight flight from Boson, we wondered if she’d be up for a photography exhibit; but, within an hour, she announced she was ready to go. We walked to the bus stop then hopped on the ferry Max and I had ridden the day before only to discover it wasn’t going to where we thought we’d be going; yet, I can’t say any of us cared for the sun was out, the sky was blue, and we were in STOCKHOLM for crying out loud. Fotografiska doesn’t present itself as a museum but rather as ‘an international meeting place for photography’. Opened in 2010 this site remains extremely popular with its 20 or so exhibitions and over 770 events annually. Drawing over half-a-million visitors a year we added our bodies to that count and eagerly purchased our tickets. Entering the first room I felt I had stepped inside a sumptously jeweled, Faberge Egg. The quiet darkness created a velvet softness instilling a reverence for the art displayed in front of us. Following my own path through the individual works of the four photographers, I became immersed in this visual feast. If you ever get the opportunity to see any of these photographers’ work, do so. Their photographs mesmerize and leave an indelible impression on one’s mind. Each of the four represented such different perspectives of life views and art. All were stunning. I’ve appreciated this French photographer’s work in fashion magazines, but what impressed me even more was hearing how well liked he was in addition to being admired by both peers and his lens’ subjects. The curator’s description of his photography echoes this unpretensioness, stating ‘his work is defined by the simplicity and modest approach he has with his models’. Look at this gorgeous shot, one of many illustrating Demarchelier’s beautiful eye. but Puffy, Puffy being his beloved dog. 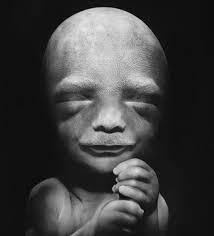 If you’re of the age when LIFE MAGAZINE was a household staple, then you’ll probably remember Nilsson’s mind-blowing images of embryos from the 60s. I do; yet, instead of feeling underwhelmed I experienced once again the wonder of how he turned the seemingly impossible into possible. With such curiosity Nilsson contributed to the technical advancement in photography. As a Stockholm native, he holds a special place at Fotografisk. No wonder considering the images he left behind. My mind utters an ‘Aha’ when reading Hang was a poet as well as a photographer. Sadly he committed suicide in February of this year. You may recall seeing these provocatively posed portraits published online with the news of his untimely death . I remember being impressed by the powerful playfulness of his subjects. They appear less as subjects and more as collaborators. And, I enjoyed the discovery of understanding what was appearing in front of me, such as eyes of red thumbs. 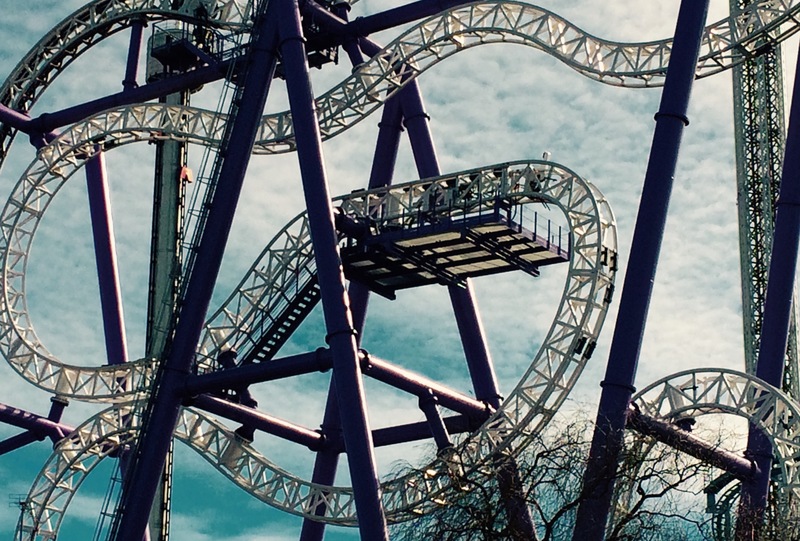 Some of his photos are raw while others cause wonder but all are well-crafted. Standing in front of his work I am thankful his photographs will continue to share his voice with the world. These two women’s work left me spellbound. Their photographs, some made as collages, dominate a wall with their size and intensity of colors. Stories lie behind each portrait, some presented in a series, and all deserve so much more time than what I gave them when touring this gallery space. The two photographers appeared in a short film explaining their work, which only made me want to see and hear more from them. If I had to choose to have seen only one exhibit out of the four, their photographs would have been it. And, if I had to have chosen just one photograph, it’s this one of a young Kyrgyzstan woman titled “The Leaving“, part of a series documenting that country’s tradition of bride kidnapping. Can’t you just see her fleeing? We left Fotografiska in awe of the artistic work we saw. 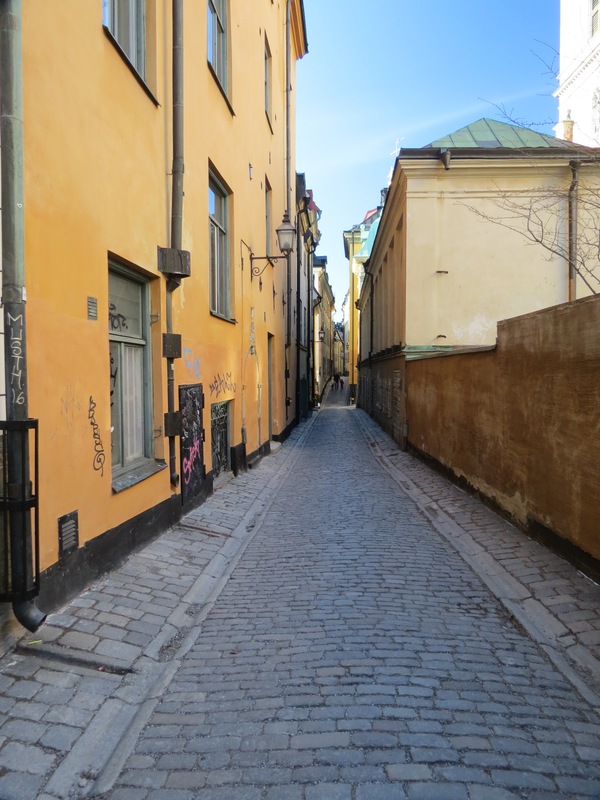 Meandering back to Gamla Stan and catching the metro home, we realized we had seen one of the true gems of this city. And, what a magical immersion it was. This entry was posted in 2017 03 SWEDEN - Stockholm, 2017 Winter Tours, COUNTRY, Europe, Sweden, WINTER TOURS and tagged Cooper, Demarchelier, Gorfer, Museum, Nilsson, Photography, Ren Hang on April 14, 2017 by margaretlynnie. Fortified with the VASA Museum’s lunch, we exit into the sun for a slow stroll home. Typically we tour one museum a day to avoid museum-itis; but, today we thought we’d check out the Medeltidsmuseet or Medieval Museum. Unsure if we wanted to put it on our ‘to-see’ list, we thought we’d scope it out since it was on our way back to the Airbnb apartment. and landed on Gamla Stan, the old town built on one of the islands. Although we were tempted to just wander through the alley ways hemmed by old buildngs, we kept going knowing we’d back to this area during our stay. Plus, it was a wee bit chilly. resulting in Max mimicking a pose he performed in 2003 next to another Romanesque statue. We poked our heads into the museum only to be captured immediately by the displays, which led us through the Middle Ages in Stockholm. The museum came to be due to a crew digging for a parking lot in the 1970s. In doing so they found foundations dating 1530s, halted construction and built a museum instead around the old city walls. Lucky us. Not so fortunate those who needed the car park. The first settlement was on the island of Birka, next to Stockholm, in 750 C.E. For roughly 200 years this town’s merchants and craftsmen traded internationally. Stockholm became the next and lasting economic settlement with the fall of Sigtuna. 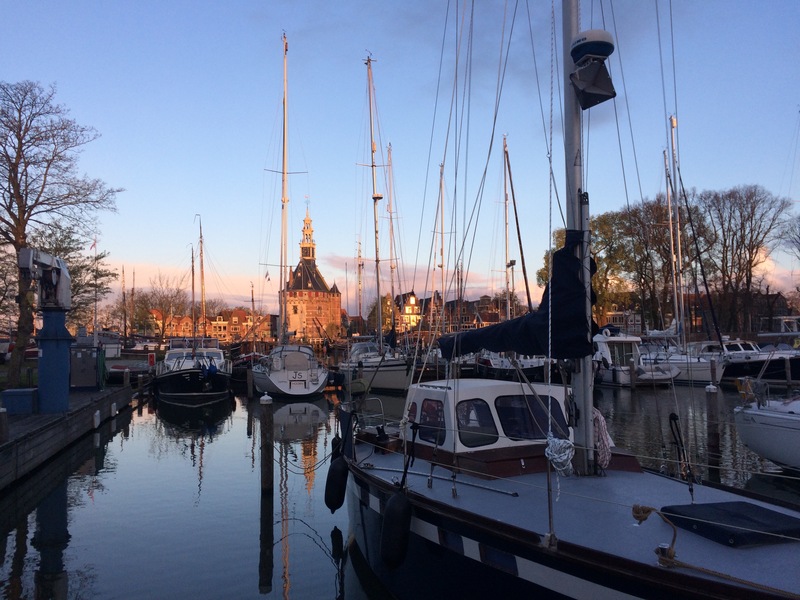 Situated in the shipping lanes going to and from Lake Malarian, the town attracted the merchants and craftsmen. With the economic growth came protection as the Royals settled in with a fortress and palace. The city’s name first appeared in writing in July 1252 in a letter of patronage for Fogdo Abbey; however, the origin of the name is still up for grabs since ‘stock’ can mean boundary posts or water that piles up or defensive logs around the town (they use to ring the harbor’s waters with posts to discourage landing of large boats carrying unsavory characters). The town evolved into a thriving metropolis, at least for the area, with a population between 5,000 and 7,000 during the latter part of the Middle Ages. When most Swedish towns averaged 500 and the next largest city being Finland’s Turku with 3,000 residents, Stockholm definitely qualified as the happenin’ place. Being the most prominent site of the Kingdom of Sweden, Stockholm attracted the attention of other kingdoms, primarily Denmark. The Danish Queen Margrethe Valdemarsdotter beseiged the city 1391-95 eventually forcing Sweden and Norway into the Union of Kalmar in 1397 with Denmark leading the pack. The Battle of Brunkeberg 1471 when the Swedes won a decisive victory over the Danish King Christian I and his Danish-Swedish Army. 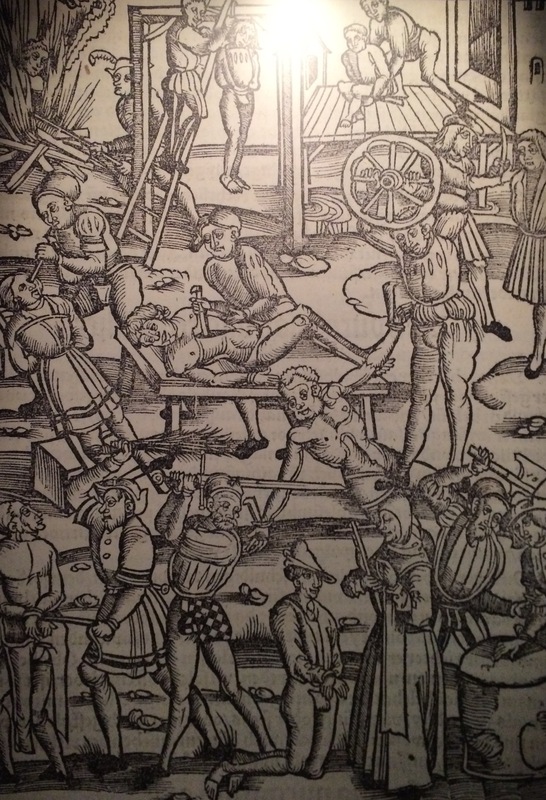 The Bloodbath of 1520 when Danish King Christian II, after besieging and occupying the city, invited those to whom he granted amnesty to a feast at the Castle only to take them all prisoner and then publicly execute them the next day either by beheading or hanging. Great hospitality. But, out of the bloodbath came freedom when Gustav Ericsson Vasa, a son of one of the headless and drooping tongue victims above, mobilized resistance to the Danes. 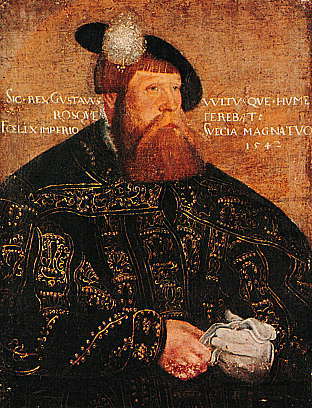 He won independence in 1523 becoming King Gustav I. This feat is celebrated as National Day on June 6. According to some historians, I’m now out of the Middle Ages (I won’t bore you with that trivial nugget of info) so I’ll stop with this abbreviated history lesson. At least you and I now see the connection between this Vasa guy and the other one who ordered a ship built that sailed. Well, sailed ever so briefly. Interestingly the Medieval Museum hosts another old ship, built in the early 1520s and outfitted with guns. 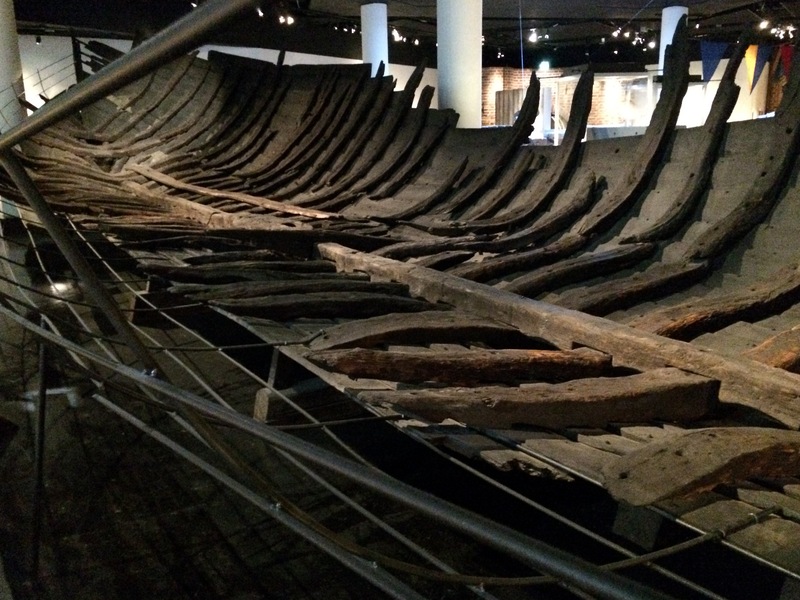 The Riddarholm Ship (it was found in the Riddarholm Canal) didn’t sail too much either. Her construction was deemed poorly built with cheap timbers. I followed the prescribed path through a sampling of how life was lived via the exhibits of artifacts and a recreated town street. One of the displays catching my eye was a 1535 painting, “The Sun Dog”. First, I was struck by how un-middle-agey it looked with the astrologcal glowing circles in the sky and, second, I thought what a weird name for a painting. 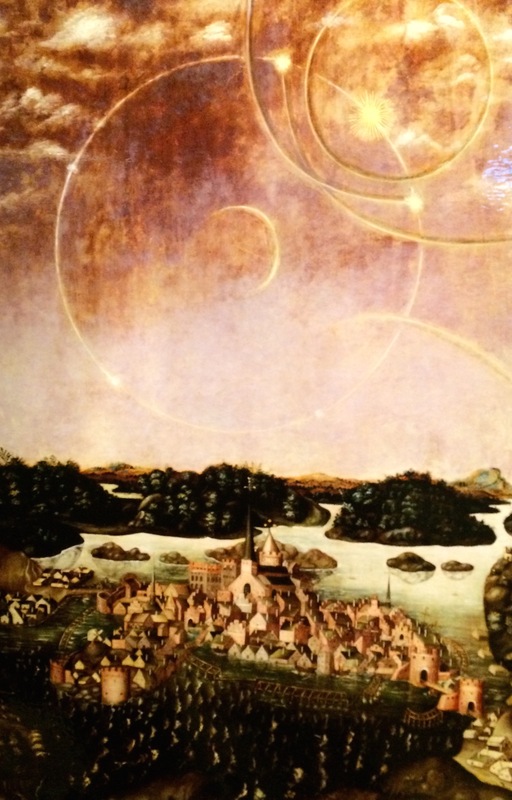 The picture is the earliest image of Stockholm and represents an actual astronomical event on April 20 of that year. As per The History Channel’s site: “Also called parhelion, mock sun, or phantom sun, sun dogs are an atmospheric phenomenon that result in bright spots of light in the sky, often as luminous rings or halos on either side of the Sun. They are formed when the Sun’s light refracts through ice crystals high in the Earth’s atmosphere. Though they may be formed anywhere in the world during any season, sun dogs are usually formed in very cold climates and are most conspicuous when the Sun is low.” If our friend Seppe, an amateur astronomer, had been with us, I wouldn’t have had to look this all up. The hour went quickly ending especially due to my seeing another lone visitor (the museum maybe had five of us there) and discovering she was from Iran, which led to conversation away from Sweden’s history. Love those chance encounters. I eventually did meet up with Max who asked if I had seen the torture picture… I obligingly took a snapshot for him to add to his MDTs (Max Disaster Tours). And, on that happy note we caught the metro at Central Station and headed home. This entry was posted in 2017 03 SWEDEN - Stockholm, 2017 Winter Tours, COUNTRY, Europe, Sweden, WINTER TOURS and tagged Medieval, Museum on April 12, 2017 by margaretlynnie.